Gwendolynne Jones Starmer, 95, of Olathe, KS passed away Friday January 18, 2019 surrounded by her loving family. She was born January 13, 1924 in San Antonio, Texas to Edward and Abbie Jones. She graduated from Olathe High School in 1942 before going on to graduate from Christian College in Columbia, Missouri, Baldwin Wallace College in Berea, Ohio and the University of Kansas. She was an accomplished music teacher, she taught piano, organ and voice and was the church organist for First Christian Church in Olathe, First Christian Church in Wheatridge, Colorado. She was the church organist and choir director at the Olathe Naval Air Station, St. Johns Episcopal Church in Dallas, Texas and All Saints in Kansas City, Missouri. 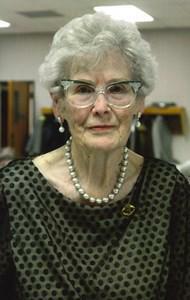 She was a member of St. Aidan’s Episcopal Church in Olathe where she was the Organist and Choir Master for many years. She taught music at St. John’s Episcopal School in Dallas, Texas for 7 years and the Kansas State School for the Deaf for 23 years. She also taught private piano lessons out of her home and at the Branch Studios in Overland Park for the Kansas City Conservatory of Music. Gwendolynne has been a teacher and church organist for more than 60 years. While at the Kansas State School for the Deaf, she organized a group of four girls as a quartet to sing and sign at programs, this eventually was developed into a group of students called “The Singing Fingers” The group performed all over Kansas and Missouri and as far as Kentucky. She retired from the Kansas School for the Deaf in 1993 and retired from St. Aidans in 1999, however she remained a member. Gwendolynne was a member of many different organizations, including Mu Phi Epsilon (music fraternity), Delta Psi Omega (educational fraternity), Olathe Music Teachers Association, and was a 75 year member of the Daughters of the American Revolution, Both her mother and grandmother were founding members of the Olathe DAR Chapter. She received numerous awards including a Who’s Who In American Education award in 1989 and 1990, and was featured in the Dictionary of International Biography in 1995. She was preceded in death by her former husband Rodney N. Starmer. She is survived by her children Gwyneth C. Starmer Wesley (Doyle) and Laurie M. Gifford (Mark), grandchildren; Jennifer Gill, Jacob Wesley, Tiffany Edwards (Jared), Curtis Nabors, and Tatum Gifford. Great grandchildren: Raquel Juache, Russel Gill, Jaylee Edwards, Brennan Edwards, Samantha Zamarripa and Mercedes Juache. Gwendolynne was an amazingly talented woman who will be dearly missed by her loving family. In lieu of flowers donations can be made to St. Aidan's Episcopal Church. Please share your memories of Gwendolynne Jones.